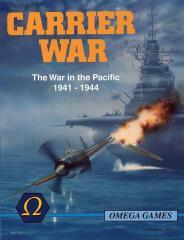 Take command of Japanese and Allied forces during the crucial years of the War in the Pacific. Maneuver naval, air and land forces from Japan to Ceylon and the West Coast of the United States. Three interactive naval/air rounds per monthly game turn recreate the excitement of fast carrier operations. Playing pieces represent American, Japanese, Commonwealth, Dutch, and Filipino land, naval and air units.